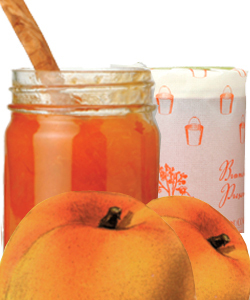 This continues to be our most popular preserves...we always sell out quickly! We are thrilled to have added Emma and Katie’s Cloverleaf Farm, near UC Davis, to our cherished line up of small farmers who grow fruits for our KATZ Preserves. These two tough women are farming 5 acres of stone fruit crops utilizing well over a dozen varieties and doing so as a certified organic operation. Finding an organic source of Blenheim Apricots, an amazingly tasty variety that is now recognized on the Slow Food Ark of Taste as they disappear from the landscape, is a boon for us and we are pleased to be able to offer them again this year. These make a preserves that is velvety in texture and even have a bit of “melting” in the mouth quality...they are a rich, elegant and tasty! Our preserves are made the old-fashioned way, and we do not use pectin! Please enjoy every spoonful of our fresh fruit preserves, and refrigerate after opening. Due to the high demand, we have a 6 jar limit, please! Making our fresh fruit preserves in the artisanal manner for 20+ years has been a true labor of love. Each new season brings the excited anticipation of visiting our farmer friends to see them once again and share in the bounty of their well-tended orchards and fields.